Problems viewing this e-mail? View online. 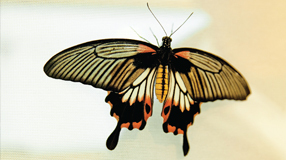 Marcus Kronforst finds clues to evolutionary adaptation in butterfly wings. Brett Goldstein, SM'05, the City of Chicago's chief data and information officer, has been named the Harris School's inaugural urban science fellow. Wine writer and restaurant critic Bill St. John, AM'77, AM'80, PhD'83, talks fear of wine and the scourge of ratings. Wayne Scott, AB'86, AM'89, knows from painful experience that an A is not a scarlet letter around here--an F is. "His love was the University of Chicago and the Archdiocese of Chicago. That's where he lived. That's where he studied." A Harris School program works to revitalize a neighborhood in Gary, Indiana. Are women's higher earnings holding back marriage rate? Chicago Booth's Marianne Bertrand and Emir Kamenica investigate the effects of changes in the gender pay gap. Argonne researchers unravel a formula to make a metallic-glass semiconducting material for use in consumer electronics. Jack Gilbert leads the Hospital Microbiome Project at the Center for Care and Discovery to help prevent patients from acquiring infections. See events across the country and around the world. Author Aleksandar Hemon delivers the keynote talk at the Seminary Co-op's grand opening event. UChicago alumni can access five research databases and thousands of publications online through the University library. Do you drink coffee from a maroon mug? Read The Wealth of Nations at the beach? Upload a photo of your UChicago pride to win gear: howdo.uchicago.edu. Relax, reconnect, and share memories with old friends and new acquaintances at Alumni Weekend. Join the conversation on Twitter using the hashtag #UCAW13. You received this e-mail as a member of the University of Chicago community.